Would you have pity on some weary travelers with mouldy bread? From Shechem the Israelites returned to their encampment at Gilgal. Here they were soon after visited by a strange deputation, who desired to enter into treaty with them. The ambassadors represented that they had come from a distant country, and this seemed to be confirmed by their appearance. Their clothing was old and worn, their sandals were patched, their provisions moldy, and the skins that served them for wine bottles were rent and bound up, as if hastily repaired on the journey. In their far-off home—professedly beyond the limits of Palestine— their fellow countrymen, they said, had heard of the wonders which God had wrought for His people, and had sent them to make a league with Israel. The Hebrews had been specially warned against entering into any league with the idolaters of Canaan, and a doubt as to the truth of the strangers' words arose in the minds of the leaders. "Peradventure ye dwell among us," they said. To this the ambassadors only replied, "We are thy servants." But when Joshua directly demanded of them, "Who are ye? and from whence come ye?" they reiterated their former statement, and added, in proof of their sincerity, "This our bread we took hot for our provision out of our houses on the day we came forth to go unto you; but now, behold, it is dry, and it is moldy: and these bottles of wine, which we filled, were new; and, behold, they be rent: and these our garments and our shoes are become old by reason of the very long journey." These representations prevailed. The Hebrews "asked not counsel at the mouth of the Lord. And Joshua made peace with them, and made a league with them, to let them live: and the princes of the congregation sware unto them." Thus the treaty was entered into. Three days afterward the truth was discovered. "They heard that they were their neighbors, and that they dwelt [p. 506] among them." 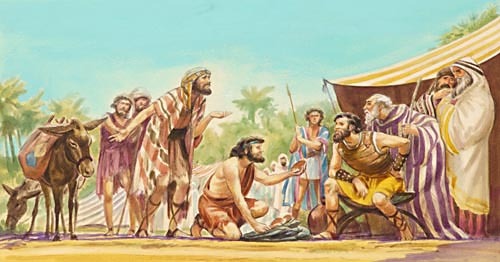 Knowing that it was impossible to resist the Hebrews, the Gibeonites had resorted to stratagem to preserve their lives. Great was the indignation of the Israelites as they learned the deception that had been practiced upon them. And this was heightened when, after three days' journey, they reached the cities of the Gibeonites, near the center of the land. "All the congregation murmured against the princes;" but the latter refused to break the treaty, though secured by fraud, because they had "sworn unto them by the Lord God of Israel." "And the children of Israel smote them not." The Gibeonites had pledged themselves to renounce idolatry, and accept the worship of Jehovah; and the preservation of their lives was not a violation of God's command to destroy the idolatrous Canaanites. Hence the Hebrews had not by their oath pledged themselves to commit sin. And though the oath had been secured by deception, it was not to be disregarded. The obligation to which one's word is pledged—if it do not bind him to perform a wrong act—should be held sacred. No consideration of gain, of revenge, or of self-interest can in any way affect the inviolability of an oath or pledge. "Lying lips are abomination to the Lord." Proverbs 12:22. He that "shall ascend into the hill of the Lord," and "stand in His holy place," is "he that sweareth to his own hurt, and changeth not." Psalms 24:3; 15:4. The Gibeonites were permitted to live, but were attached as bondmen to the sanctuary, to perform all menial services. "Joshua made them that day hewers of wood and drawers of water for the congregation, and for the altar of the Lord." These conditions they gratefully accepted, conscious that they had been at fault, and glad to purchase life on any terms. "Behold, we are in thine hand," they said to Joshua; "as it seemeth good and right unto thee to do unto us, do." For centuries their descendants were connected with the service of the sanctuary. "If a stranger sojourn with thee in your land, ye shall not vex him. But the stranger that dwelleth with you shall be unto you as one born among you, and thou shalt love him as thyself." Leviticus 19:33, 34. Concerning the Passover and the offering of sacrifices it was commanded, "One ordinance shall be both for you of the congregation, and also for the stranger that sojourneth with you: . . . as ye are, so shall the stranger be before the Lord." Numbers 15:15. Such was the footing on which the Gibeonites might have been received, but for the deception to which they had resorted. It was no light humiliation to those citizens of a "royal city," "all the men whereof were mighty," to be made hewers of wood and drawers of water throughout their generations. But they had adopted the garb of poverty for the purpose of deception, and it was fastened upon them as a badge of perpetual servitude. Thus through all their generations their servile condition would testify to God's hatred of falsehood. Click here to read the next chapter: "The Division of Canaan"